Pets Costs > How Much Does a Toucan Bird Cost? How Much Does a Toucan Bird Cost? Toucans are colorful tree-dwelling birds belonging to the Ramphastidae family. What makes the toucan particularly unique is its large, oversized bill, which also comes in a variety of colors. Because of their playful, affectionate nature, birds in the toucan family have become very popular among pet owners who love exotic animals. How much does a pet toucan cost? The costs will depend on the type of toucan, the breeder, age, quality, gender, its genetic history and geographical location. On average, from our research, the costs can range anywhere from as little as $1,500 to more than $8,500+ for a weaned younger toucan from a reputable breeder. Keep in mind these birds are extremely rare pets due to the low demand, high prices and extremely sensitive diet. This bird, as compared to most pet birds, can be intimidating to any pet owner, even those who consider themselves experienced. AdventuresInToucanland.com states toucans are quite expensive, with an investment often in the $10,000 range. A reputable breeder will often sell their toucans already fully weaned. Aside from this, they should also include some sort of health guarantee, registration paperwork, and a health certified by a licensed vet. All inclusions will vary, so it is always best to know what you’re getting in writing when making a purchase. As with any pet, food needs to be considered. Toucans, while in captivity, primarily eat fruit like papayas, bananas, and grapes; however, experts advise not give them citrus fruits. The reason for this is that toucans are prone to develop hemochromatosis or “iron storage disease.” The accumulation of high, toxic levels of iron in the bird’s liver may lead to illness and death. Aside from fruits, they also feed on eggs, lizards, insects and even small birds. In captivity, most owners offer insects as a nutritional supplement. According to AdventuresinToucanland.com, they must be fed fresh fruit twice a day and they often eat exotic fruits which are hard to find. This VCA Hospitals page also goes into depth explaining what the average toucan eats. If shipped via air or even ground, the costs can be in the $200 to $400 range. Keep in mind you may have to have the bird shipped as breeders are scarce in the United States. A larger-than-average bird cage is highly recommended due to their high energy and the room they need in order to move from one point to another. Depending on the cage setup and inclusions, this can easily cost more than a thousand dollars. Inside this cage should include perches, toys, which will need to be replaced often, and a water/food bowl to maximize its comfort while in captivity. When compared to a parrot, toucans will need a lot more space while locked up. Veterinary care needs to be considered as well. Whether it’s a routine visit or unexpected illness, the costs can add up. Being tough to train, you may need the help of a professional trainer to help tame the bird. Being more hyper than a parrot, toucans, if not trained properly, can be quite wild, which can cause quite the frustration for the average bird owner. Toucans greatly vary in size, depending on the species, and the weight can range from as little as four ounces to as much as one and a half pounds. Most toucan bodies will be short with a rounded tail, and the tail will often take up to half of its body size. The neck will be short and thick, and the base of the head will be brightly colored. The tongue is narrow and frayed on each size. Sizes can range from 18 to 21 inches long. The average lifespan while in captivity is about 20 to 25 years as long as free from any disease. Toucans tend to be friendly and affectionate. They have been known to cuddle, sit on your shoulder and will love to be scratched. Unlike most birds, toucans won’t shriek or scream. The Red Bill is known to have the loudest call out of all toucans. Do not consider clipping your toucan’s wings. 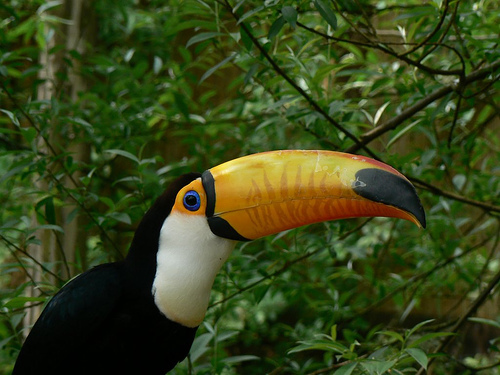 Because of their large beaks, toucans cannot climb; instead, these birds fly from one part of their cage to another. Toucans, in general, are tolerant of weather and temperature changes. However, make it a point to let them out in their outdoor aviary during the warmer months of spring, summer and fall. In the winter, it is best to keep them indoors with a controlled comfortable temperature. Other diseases toucans are prone to include gastrointestinal infections caused by E. coli and salmonella, and parasites such as capillaria, roundworms, and proventricular worms. Toucans aren’t able to bite hard since their beak muscles are weaker when compared to other birds. Unlike other birds, they tend to be less aggressive and the pressure of their beak, even if they do try to bite, will be lightweight. A toucan can be kept with other birds in the same room; however, they can’t be kept in the same cage. They can be housed with other toucans, however. According to experts, the best time to adopt a toucan is during the summer. This is the most common breeding season, which lasts from April until September. Can you have a toucan as a pet? From our research, it appears most states allow a toucan as a legal pet; however, to be safe, talk with your local state wildlife department to make sure before making a purchase.